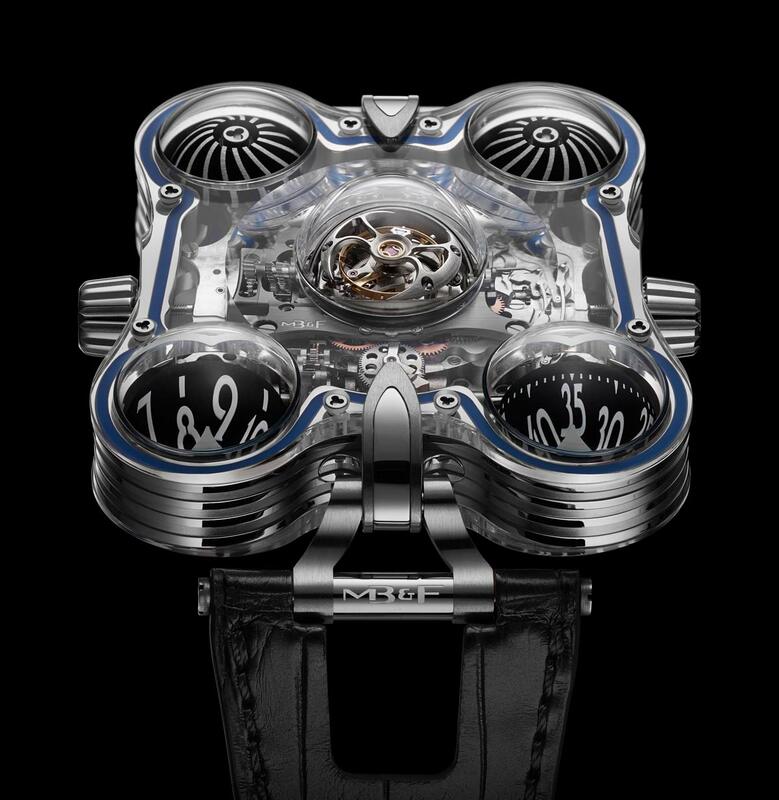 When introduced at the end of 2014, the Horological Machine N. 6 from MB&F created lot of buzz for its unconventional design characterised by organic shapes. Starting from the same movement architecture, the new Horological Machine N° 6 SV (where SV stands for Sapphire Vision) surprises again by revealing the engine that beats inside through two transparent sapphire crystal plates connected by a case band crafted in either 950 platinum or red gold. The nine sapphire crystal domes – five on top and four underneath – are fastened to the transparent plates thanks to a special gluing process, achieved under vacuum in a high temperature oven for maximal strength and water resistance. 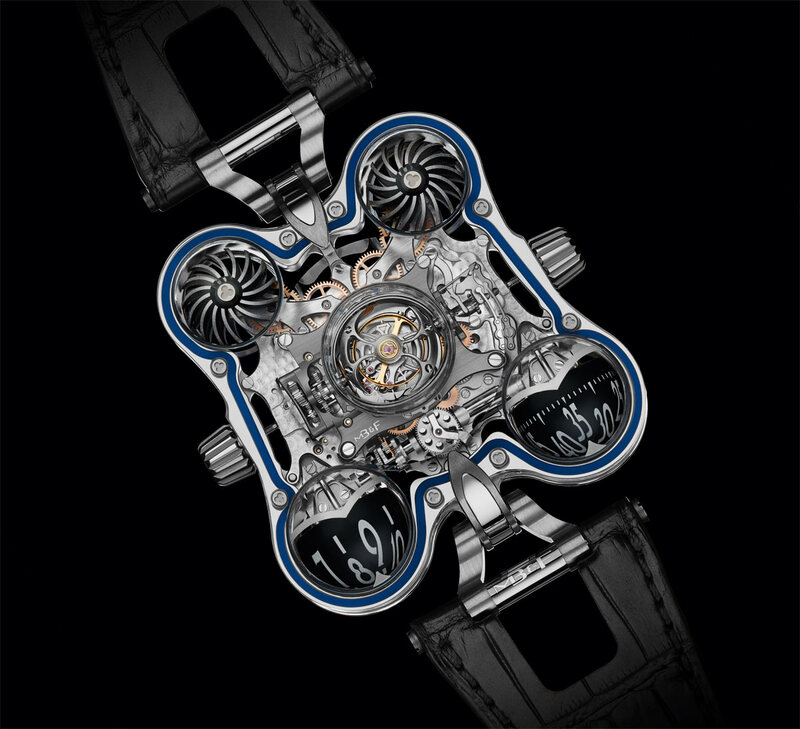 As it is easy to understand by exploring it, the complex shape of this case is extremely challenging to manufacture and therefore the HM6 SV will be produced in two very limited editions: 10 pieces in platinum/sapphire crystal and 10 in gold/sapphire crystal. Size is 51 mm × 50 mm × 22.7 mm. 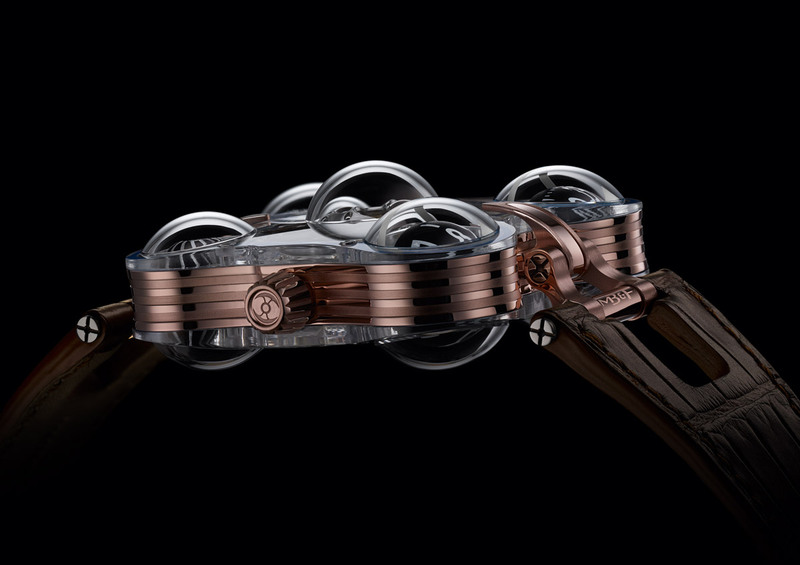 The sandwich construction is highlighted by the coloured stripes of the water-resistance seals. At the front, two spherical domes rotate vertically, respectively displaying hours and minutes in large, highly legible numerals. 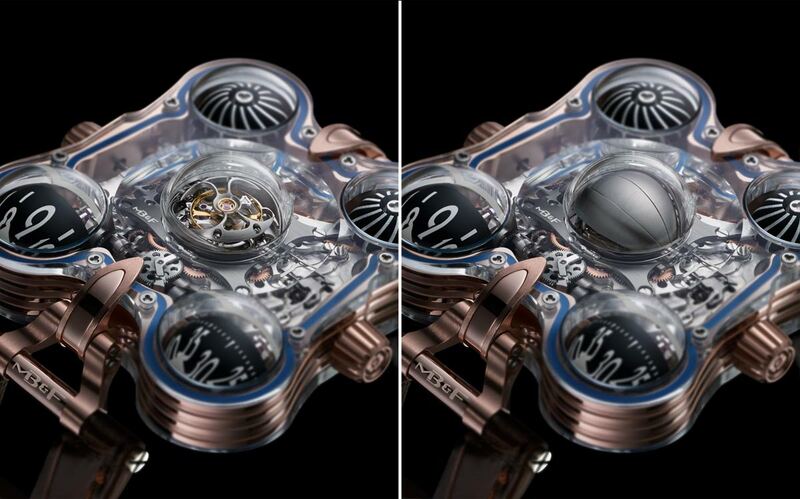 On the other side, twin spherical turbines spin horizontally, driven by the rotor and multiplying gearing, to automatically regulate the winding system. The central dome houses a 60-second flying tourbillon, a high-precision regulator which a retractable, semi-spherical, titanium shield protects from ultra violet radiation that may affect the viscosity of lubricating oils. The cover can be opened or closed using the crown at 9 o'clock. 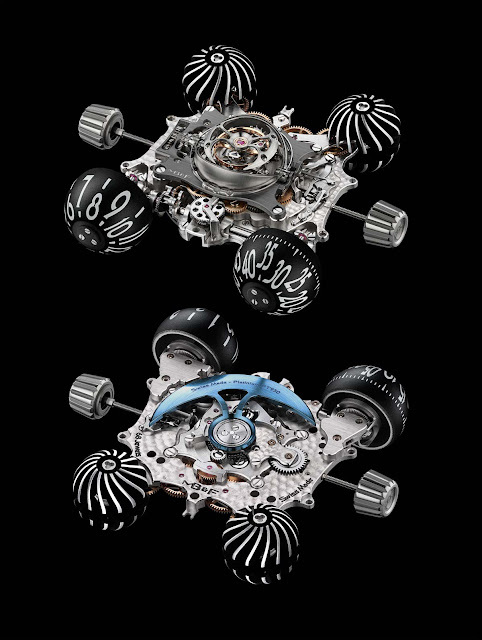 Beating at 18,000 vibrations per hours and offering 72 hours of power reserve, the HM6 SV movement is comprised of 475 finely-finished components and required more than three years of development due to the challenges that had to be overcome. 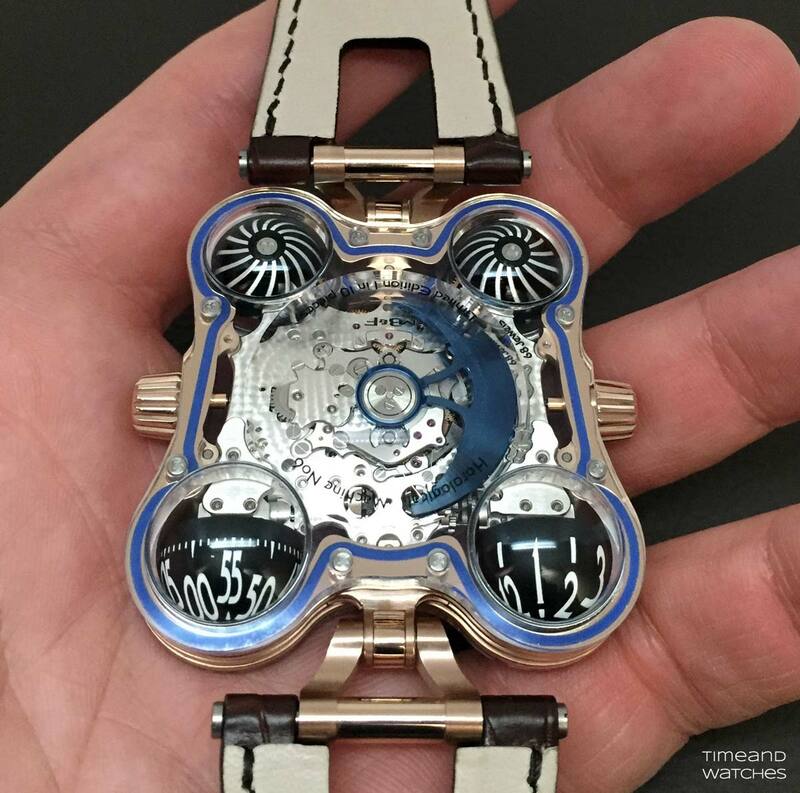 Nearly every component and mechanism had to be developed from scratch specifically for the movement. The aluminium indication spheres displaying hours and minutes are machined from solid blocks of metal to an ultra-light paper thickness and revolve on ruby bearings. The spheres rotate vertically at 90° to the plane of the movement, which is extremely rare in a wristwatch due to the complexity of the drive train and gearing required. The choice of the flying tourbillon positioned above the movement was the consequence of the limited space under the top of the sapphire crystal dome, which could not accommodate the upper supporting bridge of a standard balance wheel. The two spherical turbines, each composed of no fewer than 15 curved vanes, are machined in two hemispheres from solid blocks of aluminium. These turbines are driven from the rotation of the automatic winding rotor by a gear train designed to amplify the number of rotations. If the winding rotor starts rotating too quickly – most likely due to highly active movement of the wrist – air friction on the turbines increases and helps counteract the excessive speed to minimise wear. MB&F Horological Machine N. 6 SV (Sapphire Vision). 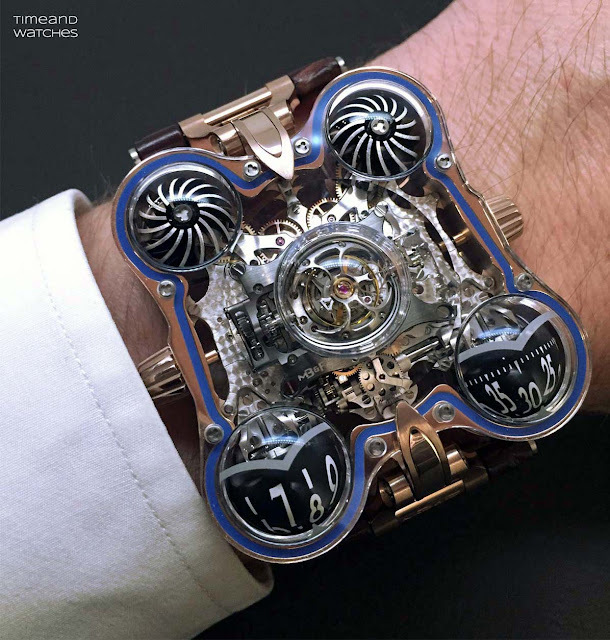 Starting from the same movement architecture, the new Horological Machine N. 6 SV (where SV stands for Sapphire Vision) surprises again by revealing the machine that beats inside through two transparent sapphire crystal plates connected by a case band crafted in in either 950 platinum or red gold. 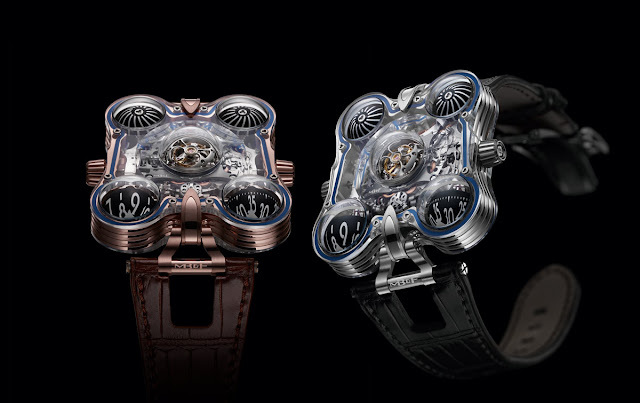 The MB&F Horological Machine N°6 SV has a price of Swiss Francs 350,000 in red gold/sapphire crystal or Swiss Francs 380,000 in platinum/sapphire crystal.